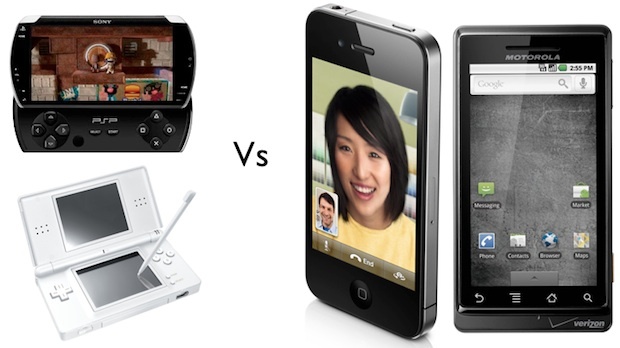 Can 3G Nintendo DS and Sony PSP Compete With Smartphones? While your Nintendo DS or Sony PSP may be pretty clever at wireless connection over Wi-Fi, when you wander out of antenna range you’re doomed. To combat this problem, these two companies are creating new technology to boost Wi-Fi reach. But is that enough to stay competitive? As reported by the Wall Street Journal, NTT DoCoMo–Japan’s cell phone network with the most subscribers–is in discussions with manufacturers of handheld games consoles to bring 3G data network capabilities to the next generation of devices. While NTT’s Ryuji Yamada, the source of the information, wouldn’t share any information on the parties involved, it’s easy to imagine that Nintendo and Sony are on this list for their big-selling DS and PlayStation Portable devices. Yamada noted, during an interview that “Videogame makers know that in order for portable game machines to take the next step forward, they need wireless communication” and we already know that Nintendo is intending to build expanded Wi-Fi powers into the next-gen DS (including automated content downloads when in Wi-Fi range), so 3G is the logical next step to take. The DS’s and PSP’s future-boosted Wi-Fi powers are good for downloading extra content, and even playing multiplayer games, but since you’re tied to a Wi-Fi router there are limits to options like location-based social gaming. What’s more, the short leash of Wi-Fi limits anti-piracy measures. Meanwhile, smartphones, with Wi-Fi, 3G, GPS, motion-sensing and built-in mics and cameras, have become excellent gaming platforms, transforming the mobile gaming market. Their CPUs and GPUs have potentially more power than Nintendo’s or Sony’s devices, and they offer all sorts of game interactivity that neither the DS or PSP can even begin to compete with, thanks to systems like multitouch screens and the new iPhone 4’s gyro. With an app store ecosystem behind each phone, ready to supply new games, in-game extras and so on while you’re out and about, they’re very quickly eroding the business model for dedicated handheld consoles. If Nintendo and Sony get cheap data contracts negotiated with global cell phone data providers, and get their next-gen consoles on the market sooner rather than later, then this effort may well work–trading in part off the gaming brands these companies possess. Apple and Google, without the game software and intellectual property licenses of Nintendo and Sony, might not steal the show, but could certainly put a dent the market.